Some of today’s crowds watching the cleaning in Structure Ten. And lo and behold – the sun finally shone on the Ness. Not that we are really complaining about the weather over the last two days, but the sun definitely improves the general feeling on site and has brought out large crowds of visitors for our first guided tours of the year. General cleaning of the site is still ongoing, with the interior of some of the buildings now taking precedence. This is a very careful procedure as we don’t want to remove much of the precious floor deposits – so a light touch with a trowel, or “leaf trowel” with a sharp edge, is required just to freshen them up. Dan re-establishes and checks the site grid. Sarah and Mike, who are in charge of Structure Ten this year, have started this procedure while also cleaning the delicate internal wall faces. Even with the robbed-out state of many of the walls, the splendour of this building is once again very clear. With more of its original plan coming to light, this structure, when first constructed, must have been one of the wonders of the Neolithic world. Although the original plan is mainly defined by basal courses and robber trenches, we are hopeful that more of the primary wall faces may lie obscured behind some of the later alterations, when its internal plan was made cruciform rather than the original plan we envisage, square with rounded corners (just like Structure Eight at the nearby Barnhouse Settlement). Initial cleaning within Structure One. 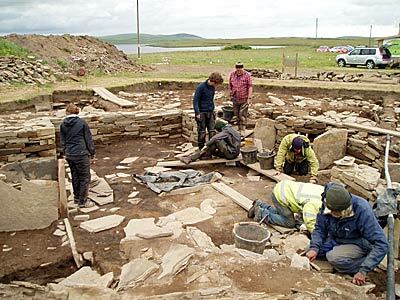 Similarly, the interior of Structure One is being cleaned in readiness for excavation. 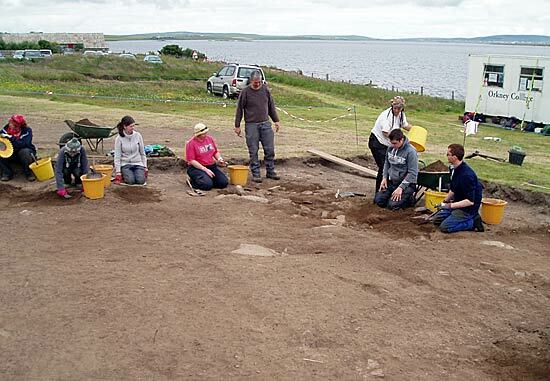 Hopes are high that the hearth revealed last year, which relates to its secondary major phase, will be ready for excavation tomorrow in preparation for Dr Cathy Batt from Bradford University. Cathy, and her assistant Zoe Outram, will be on site early next week to take samples for archaeomagnetic dating of this hearth and ones in other buildings. Fingers crossed that their results will complement and confirm our radiocarbon dates. 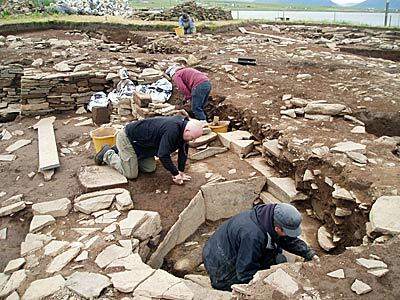 Meanwhile, the novices among our volunteer force were introduced to the techniques of trowelling and gentle mattocking as they were set to work on the new extension to the main trench that will hopefully reveal the full extent of Structure Fourteen. Under the careful supervision of Jim Rylatt, they carefully cleared away the remnants of the topsoil left by the mechanical digger to reveal the top of archaeological deposits. Once again the shallow depth, at which archaeological deposits are encountered, barely 0.2m deep, makes one aware of the vulnerability of the archaeology and the miracle that it has not been ploughed away. Already, though, potential wall lines are emerging, enthusing the team to yet greater efforts. Over the winter, and during the process of removing the winter covers, some of the carefully laid out site grid pegs have become dislodged, so Dan has been busy checking the grid and putting in some new pegs and survey stations. So much of what we do – how we record the location of small finds, the basis of plans and sections etc – relies on the accuracy of the site grid, so it is always best to double check this. A welcome face back on site was Professor Scott Pike, from Willamette University, Oregon, who just flew in, in preparation of his students arriving this weekend. Scott has once again came armed with his portable XRF machine which is proving indispensable in the analysis our floor deposits. Scott’s arrival, and his scientific background, were opportune as we were paid an unannounced visit from Dr Joseph Heyman, a retired scientist from NASA’s Langley Research Center – it never fails to amaze who the Ness attracts! Sarah, Mike and Cecily start the clean of the floor deposits in Structure Ten. 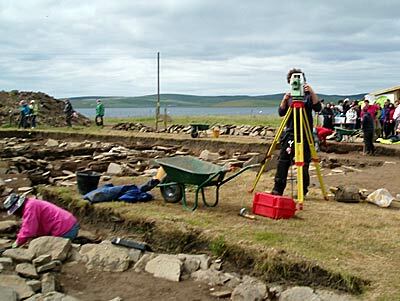 My name is Ciera and this is my second year at the Ness of Brodgar. 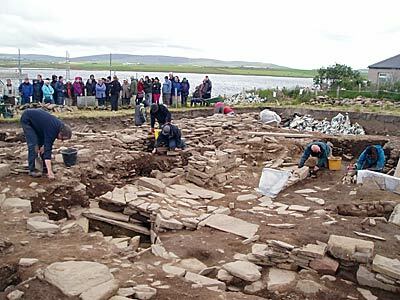 Last year, I was here for the UHI Excavation module as part of my cultural studies degree and was only here for two weeks. This year, I’m lucky enough to be here for the full six weeks, which I’m very much looking forward to. The site is much bigger than last year so it’ll be interesting to see what changes the site goes through this year, with more people and more structures being exposed. Today, the weather is much nicer than the weather report let on, so it’s sunny with some clouds and a bit of a breeze to keep the bugs away. I’ve been in the new trench extension, which will hopefully uncover the full extent of Structure Fourteen, with the other UHI students. Already we’ve had some nice finds — lots of pottery and bits of bone coming out of the top soil. I found a beautiful flint knife which is still all in one piece. I had a chance to have a closer look at the edges in the finds hut. Later it’ll be cleaned up and put out so people have a look at it as well which I’m looking forward to. Like any keen archaeology student, I spent about five minutes jumping up and down with excitement when I found it. Everyone on site is covered in dust and mud and as happy as can be. Three days into the dig and already we’ve found some amazing things. It’s going to be a great six weeks! New recruits cleaning back the new trench extension – already new wall lines are apparent.